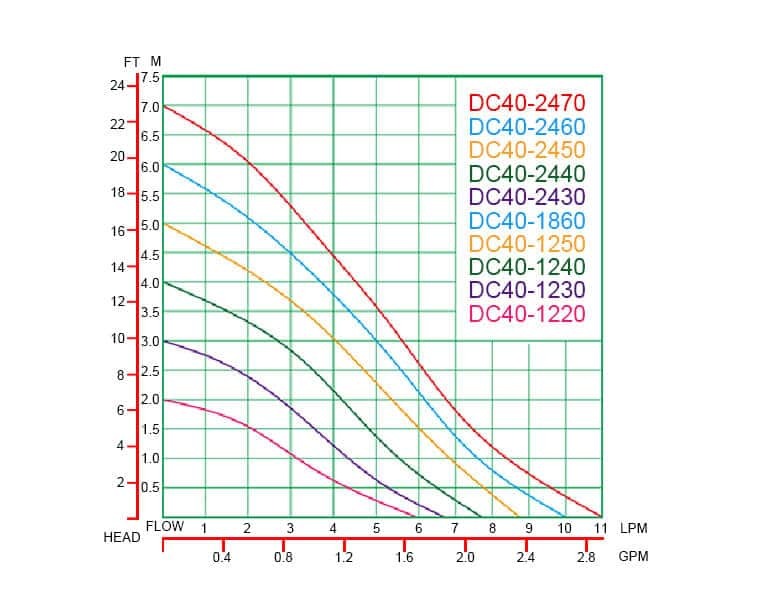 DC40 Series Circulation Pumps design small dimensions with a compact structure. It is quiet and light. It was driven by brushless DC motor and has a leak-free structure. It used Hall sensors for electronic direction switching, driven board located inside of the pump body, No wear, No leakage, suitable for general occasions. Not suitable for frequent switching, vibration, high temperature and other complex environments. Small size with high efficiency, low power consumption, strong anti-jamming ability, stable performance. Brushless DC magnetic driving technology with no pollution static seal structure, Never need to worry about leakage. Use high-performance ceramics shaft and high-precision carbon fiber sleeve together to guarantee a long lifespan. The pump could run with wide range working voltage, you can adjust the input voltage to control the pump performance. The pump is suitable for a long time continuous working and with a long lifespan more than 20000 hours. Safety – no spark, Explosion-proof; Low noise about 40dB; Low or No Maintenance-free; Submersible, 100% waterproof. 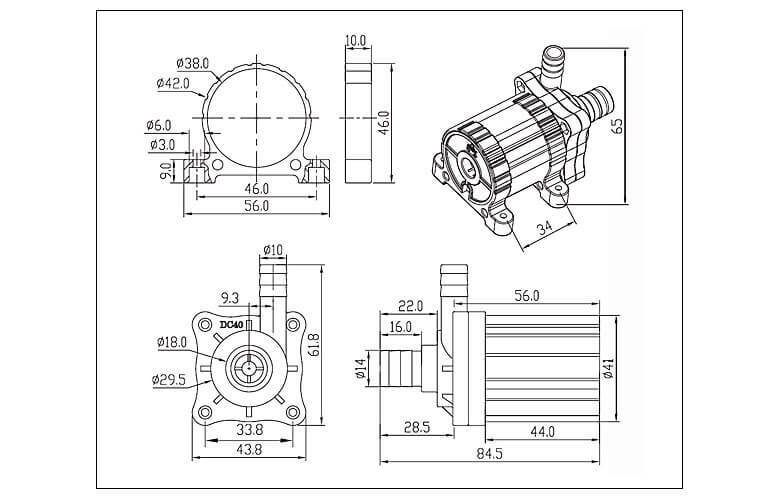 Our circulation pumps are ideal for various general, commercial and industrial applications. Such as electric automotive cooling systems, automated equipment water cycle, water cooling and other electrical appliances, water dispenser, sanitary products, paper shredders, soilless cultivation, plumbing mattresses, air pump, aquarium fish tank,desktop crafts, foot bath, plumbing mattresses, water heaters, PC water cooling, water cooling fan, medical devices, pharmaceutical systems, chemical circulation systems,cooling system, water-cooled air-conditioning, water cooling fan, mobile bath, solar fountain, solar circulation system, water supply systems, small irrigation systems, water treatment systems, automobile circulation systems, automotive heating systems, machine tools, household appliances, kitchen appliances, bathroom products, hot water circulation system. 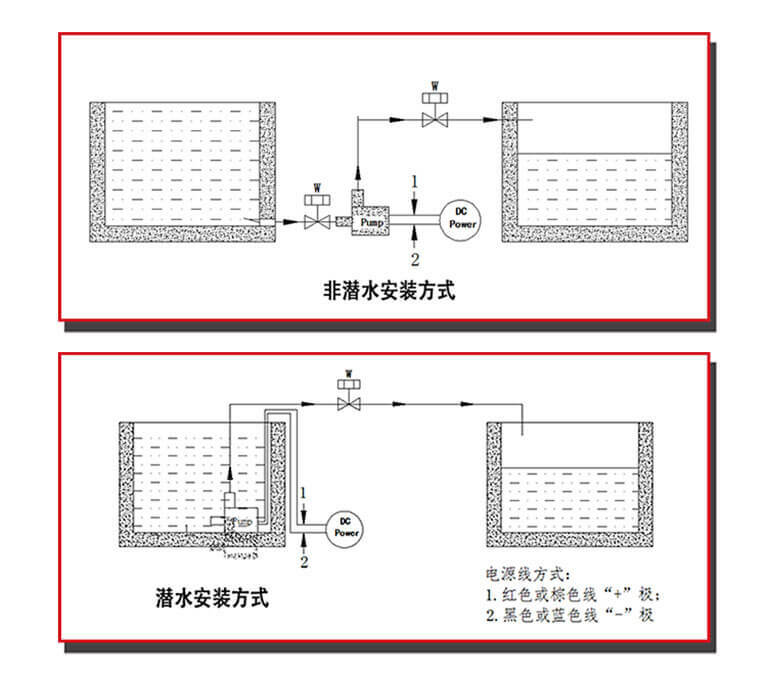 Overvoltage, reverse polarity wiring is not allowed (except customized model). The pump is not self-priming, it must be installed under the liquid level or submersible. The dry operation for a long time will damage the pump. Ensure the liquid clear, Prohibit impurities entering the pump.